Water Garden's 10 Amp Solar Charge Controller (wired between a 12V Solar Panel and 12V Solar Battery) is necessary to regulate the output voltage from the solar panel, in order to achieve the maximum recharging efficiency and protect the battery from overcharging with excess voltage. 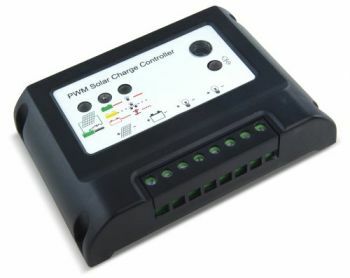 This intelligent Charge Controller features simple screw terminals for connecting the Solar Panel, Battery and a 12V Output. The unit also features a 'test mode' button which can be used to switch the power on or off, making this ideal for connection to Aquarius Solar Fountain Pumps. Suitable for use on Solar Panels up to 200 watts. Simple to wire between Solar Panel and a Deep Cyclic Battery. 1 x Dedicated 12V electrical outlet. Manual On / Off Operation Mode. Short Circuit protection / Overload protection / Over-discharge protection.